On Saturday(February 2nd) the premiere of 'The Lego Movie 2' took place at the Westwood Village theatre in Westwood, CA. Elizabeth Banks made her return to the carpet wearing a DAVID KOMA RESORT 2019 navy sleeveless, padded shoulders embellished midi dress, featuring an asymmetrical front split. While her black accessories work here, and she looks great, I actually prefer the dress on the model, especially with the white pumps. Tiffany Haddish wore a BALMAIN SPRING 2019 white long sleeve mock neck pleated knit, mini dress. Tiffany's dress was edited from the runway version which featured an silver embellished belted and a layered frayed panel on the skirt. Love Tiffany's beauty look but this dress it too tight on her and it makes her look stiff. Alison Brie snapped a pic of her look as she always does before she hits the carpet. 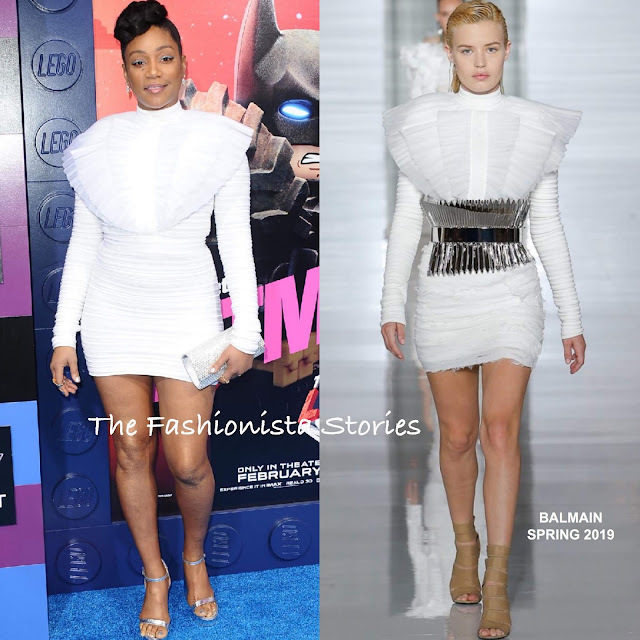 She wore a the MAGDA BUTRYM FALL 2018 'Carlton' dress which she accessorized with GRAZIELA GEMS earrings, a COLETT ring and JIMMY CHOO sandals. Stephanie Beatriz sparkled in a multicolored ELLIATT crop top and matching skirt which stopped just below her knees. While she could have easily gone with black sandals, I am glad that she chose these magenta STUART WEITZMAN's. DANA REBECCA, RACHEL KATZ, GRAZIELA GEMS & MELINDA MARIA jewelry rounded out her look.